The Light Weight Deflectometer from TERRATEST convinced the expert audience of the track construction industry during EXPORAIL 2015 in Cancun, Mexico. On the 9th and 10th of February the operation of the Light Drop Weight for the dynamic plate load test TERRATEST 4000 USB was presented by representatives of the TERRATEST company at the LARGEST track construction fair of the country. 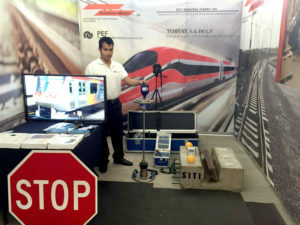 “We are indeed pleasantly surprised by the great feedback of the Light Weight Deflectometer”, says Fernandez Gijon, general manager of Ferrovias Construcciones Mexico S.A. “We spoke to potential customers here at the fair and were able to make them specific offers”, adds Gijon. TERRATEST’s Light Weight Deflectometer complies with the German standard RIL 836 of Deutsche Bahn AG for the use in track construction. It has been used for many years by numerous track construction companies worldwide, among others in China, Mexico, India, Russia, Romania and Germany, for the dynamic plate load test in earthworks. The easy operation and the precise test results of the Light Weight Deflectometer are unbeatable arguments for an efficient implementation of the dynamic plate load test. Especially the TERRATEST 5000 BLU, the world’s first Light Weight Deflectometer with Bluetooth technology, is in high demand abroad. “Over and over again our customers are delighted by the possibilities offered by our dynamic load plate with Bluetooth technology and app-connection”, says Frank G. Schulz, CEO of TERRATEST GmbH Berlin. “The cable connection of the Light Weight Deflectometer has been replaced by Bluetooth technology. This is a great advantage, since it is no longer necessary to re-connect the load plate, which is placed on the ground, for each test”, adds Schulz. TERRATEST GmbH produces the world’s first Light Weight Deflectometer for the dynamic plate load test with Bluetooth technology, voice navigation and Android app for smartphone or tablet.